How long does it take to change your life? 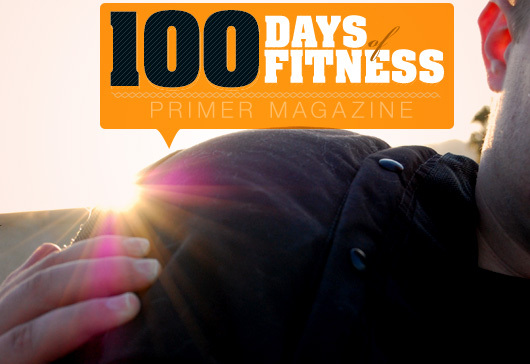 Follow author Robert Fure as he begins a 100 day trek to a fitter, healthier life by following this simple program. Today, we talk about equipment that can turn your living room into a den of pain on the 100 Days of Fitness program. Last week we talked about exercise and hopefully you saw that with nothing more than a pair of shoes and a couple of dining room chairs, you can get a pretty full workout. Push-ups are great (really great), but variety being the spice of life and all, you probably want to get some variation in your workout, and possibly lift some heavy weights. Like I also said, you can join a gym. Plenty of people do. There is a ton of equipment, great machines for beginners, and terrible techno music playing. The average cost of a year long gym membership in a big city is something like $365. If you've got the money to spend, that can be a decent investment. If you don't have the money to spend, or would prefer working out at home, a home gym can be built for very reasonable prices. My own personal home gym has twelve pieces and is probably valued at around $400. I'll break most of that down for you later, but it's important to note – I didn't buy it all at once. Adding a piece here or a piece there doesn't feel like a burden. Plus, this $400 gym membership lasts a lifetime, provided I don't toss a weight off a balcony. My set-up also includes a few things you don't need, but are nice to have and a few things I had to try out, but wouldn't necessarily buy again. Right about now you might be thinking “I don't have enough room for a home gym.” Well right about now you're wrong. My gym takes up approximately six square feet. You can tuck away all your equipment in a closet or a corner of the room. So lets talk about this home gym. First, the essentials, then I'll talk about what I have and link you to some reviews of some of the more specialized items. I personally have a 24kg (53lb) kettlebell for this area. 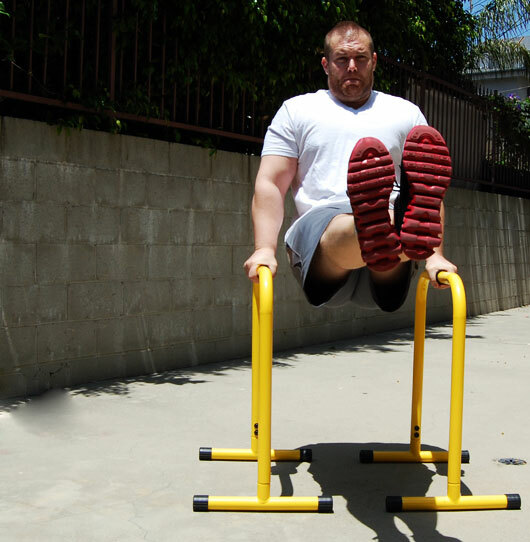 It cost around $80 but is the single most versatile workout tool I've ever owned. You can get lighter ones for much less, or whole sets for $80 at some sporting goods stores. It's probably worth your while to track one down in a store rather than order online though, because shipping on a giant ball of steel is expensive. In the near future, I'll write a more detailed article on using a kettlebell, so stay tuned. In place of a kettlebell, you could buy a single dumbbell. I use one that is about 40lbs, but I've been lifting a long time, so you should get a weight that's comfortable. You want a weight that will be challenging across a variety of exercises. If you can curl a 15lb weight twenty times without getting tired, it's too light. If you can't curl a 30lb weight more than 3 times, it's too heavy. But a single heavy weight will let you do plenty of arm, shoulder, chest, and leg exercises. You can go to a sporting goods store and test them out a bit and find what is right for you. Most, if not all, come with door attachments, which basically allow simple tubing to become a cable machine. You can use bands for chest, back, arms, shoulders, abs. Virtually everything. Slung across your back with a handle in each fist and you can even maximize your push-ups. Seriously. It's $15 for a pull-up bar or like $30 for one of those gimmicky ones you see on TV that let you do pull-ups and push-ups and crunches. GET ONE. Pull-ups are a great exercise for your arms and back. Being able to do a lot of pull-ups is very impressive. At my most fit ever, I once did 21 in a row. To put that in perspective, a Navy SEAL only has to complete 8 pull-ups to become a SEAL, and 15-20 is considered very good. Now just imagine you, in four months, telling your friends you can do as many pull-ups as a Navy SEAL. See last week's installment on why chairs are awesome. So if you're going to start off on building your own home gym, that's where you should start. You already have chairs (I assume) so you're looking at an investment of between $45 and $100. That's a third the cost of buying a gym membership, plus you don't even have to leave your own living room. 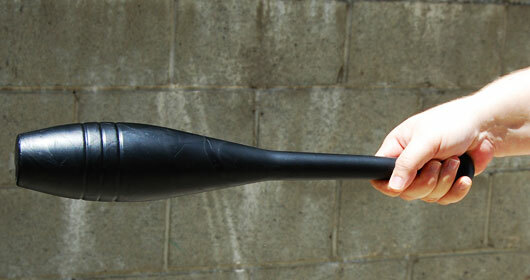 Now, for reference, my more specialized gym equipment. Click each title to get more detailed reviews I've done. I'll admit to being somewhat obsessed with eras past. Part of me has always wanted to play cowboy and the thought of wearing a leopard print suit and pressing giant, comical weights above my head seems awesome. Okay, so that's a slight exaggeration – I wouldn't be caught dead in a leopard print suit. But I do like old school training methods. The Indian Clubs are a long forgotten tool now just making a come back in some circles. These bowling pin-esque items are most often used for light cardio, post-workout stretching, and flexibility improvement. There are some big, heavy ones you can buy that would help for strength, but I prefer to use smaller ones after a workout to help strengthen and stretch the shoulder girdle. Full review of the Indian Clubs here. If your girlfriend is upset that you're scuffing up her chairs or sweating all over her couch, these are the solution for you. Sold as a pair of units, the Equalizers allow you to do some exercises at home that were previously only available at the gym and also replace your chairs as exercise equipment. With them you can do rows, dips, ab work, triceps work, and can add variety to your push-up routine. Full review of the Equalizer here. It's available on their site: The Lebert Equalizer. I have two sandbags, one that I paid top dollar for to test out (over $100) and one that I built myself out of an old book bag ($3 not including book bag). Sandbags are currently coming back into style in gyms all over. The bags aren't packed very tight, which allows the sand to move around while you lift it, creating different challenges on every move. The pliable bags also allow for a variety of grips, while their modular nature allows them to have the weights changed by removing internal bladders. If you're not going to the gym, and thus wasting money by paying for something you don't use, cancel the membership and instead buy a few of these home items. Or, if you don't have a gym membership, buy these home items and all of a sudden you have a gym membership. If you're feeling hesitant about getting an effective workout at home, I feel you. I used to think the same way. I didn't want to do push-ups and light squats, I wanted to go to the gym. But let me tell you, if you have a few of these items and run a circuit on them, in 45 minutes you'll get one hell of a work-out without having to suffer through the smells of a gym. 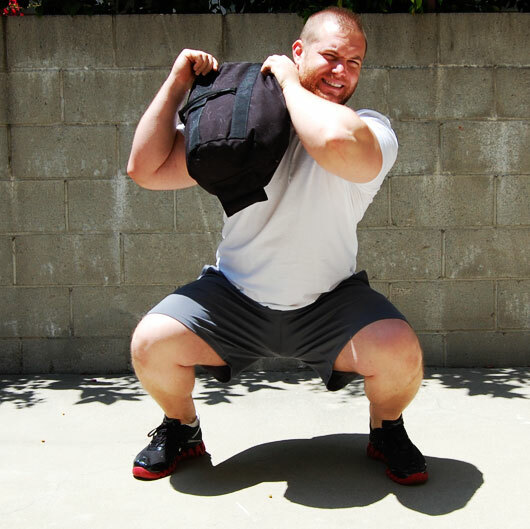 Full review of a sandbag workout here. I got mine at Henkin Fitness Systems. Last week I was a little disappointed in a 1.5lb loss, but this week I'm very satisfied with a drop of three pounds, bringing my weight down to 243.5. That gives me a total weight loss, in three weeks, of eight pounds. Can't be unhappy with that! Remember, this isn't The Biggest Loser. Most of us aren't 580lbs and working out 4 hours a day six days a week. You shouldn't be expecting to drop 10 or 12 pounds in a week. But dropping, one, two, three, even four pounds in a week? That's attainable, especially at the beginning. How are you doing? 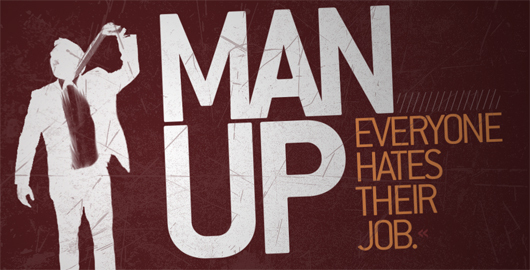 Keep it up – or get better. Robert, after looking at those pictures, I’m reminded of Rocky 4, when Drago is using all that high tech equipment while Rocky is sweating away with the low tech stuff. This kind of low tech training is taking on momentum again. I just read something about Robert Downey Jr. getting in shape for the latest Ironman by swinging a sledgehammer at monster truck tires, then pulling them across a field with ropes to train his legs. Kudos to you! Keep it up! I like the comparison. I’m definitely a fan of all this old school stuff. Weight lifting doesn’t have to be complicated or technological. I’ve always felt all you really need is a heavy weight and a desire to lift it. Plus, what I really like is that I can do all of this in my apartment if I want to, or I can carry it somewhere else. To use most of the stuff, you only need about 5×2 feet of floor space. .-= Robert Fure´s last blog ..From Milk Crates to Crate & Barrel: Transitioning from Dorm Room to Fully Fledged Home =-. Good article. I like the part with the sandbags, that looks like a really effective piece of equipment at a low cost. Also your comments about the SEALS, that’s bull. Those 8 pullups are all that are required for their basic physical test, but that test involves doing everything from swimming, running, pushups, and whatever other nasty exercises available (there are like 10 different things they have to do, back to back). I can guarantee that they can do more than 8 pullups. Good stuff though.